Even if a certain movie-classic hints otherwise – Baaders Morpheus® are absolutely real. Featuring a true 76° field of view, they immerse you in the Universe without having to roll your eyes. The big eye relief is perfect for observing with glasses and the comfortable viewing- behavior leads to a “Spacewalk-feeling” that normally is provided only by eyepieces with a much larger and inaccessible apparent field of view. Meanwhile the image in no way appears distorted or like viewing through a fishbowl. Center contrast and brilliance match those of the finest planetary eyepieces – while even with the fastest telescope optics you will enjoy tack sharp stars close to the outer edge of the field. Immersive Views: As avid observers ourselves, we have studied the behaviors of most commonly available wide field eyepieces and listened to other observers comments on what eyepieces give the most palpable and engaging wide field viewing experience. What we found is that the subjective ‘spacewalk’ feeling is not just a function of field of view. Interestingly, some wide-field eyepieces with fields of 82 degrees failed to deliver the same viewing experience as others with similar fields, or even some with smaller fields. We found two additional primary factors played into the equation – Eye Relief (and the related large eye lens size) and Ease of Viewing (a combination of long eye relief and control of pupil aberrations). We also found that fields much below 74 degrees tended to have a reduced effect. 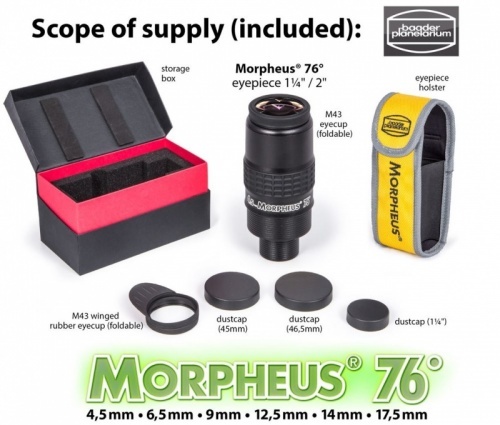 So, with this information in hand, we set out to design a new eyepiece with a field of view greater than 74° that met all of the other optical parameters necessary to deliver a truly "immersive" viewing experience where the eyepiece essentially disappears. The result is Morpheus®.